The 2019 Conference of the Public Interest Section and Doctoral/New Scholar Consortium was a huge success! The 2019 Conference of the Public Interest Section and Doctoral/New Scholar Consortium was held in Orlando, FL, at the Embassy Suites Orlando from March 29-30, 2019. Thank you to all the attendees who helped make the meeting s huge success. We look foward to seeing you in 2019! 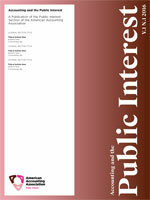 The overall objective of the Public Interest Section is to promote knowledge and responsible action with respect to the role and effects of accounting information and social and ethical responsibilities of accounting professionals in areas including social and environmental accounting, public interest issues, government/profession regulation, professional and business ethics, direct assistance programs, and, in general, contributing to the quality of our common life. The 24th Annual Ethics Research Symposium, sponsored by the American Accounting Association's Professionalism and Ethics Committee and the Public Interest Section, will be held at the AAA Annual Meeting in San Francisco this August. Hong Kim Duong, Marco Fasan, Giorgio Gotti "Living Up to Your Codes? Corporate Codes of Ethics and the Implied Cost of Capital"
John E. Simms "Teaching Accounting Ethics Using Ex Corde Ecclesiae"